A recent conversation with a new arrival about a frustrating bus experience got me thinking. When I first moved to Rome it was in the pre-smart phone days. There was no google maps to guide me through the charming labyrinth of cobblestones. I had a laminated map that had almost all the streets I needed on it. I got lost. A lot. ATAC buses didn't have GPS tracking, there was no Google translate. How did we do it! You don't have to answer that. I was an expat in the days of blue airmail envelopes. I remember. If you are a smartphone owner, life in Rome is much easier than it was eight years ago. 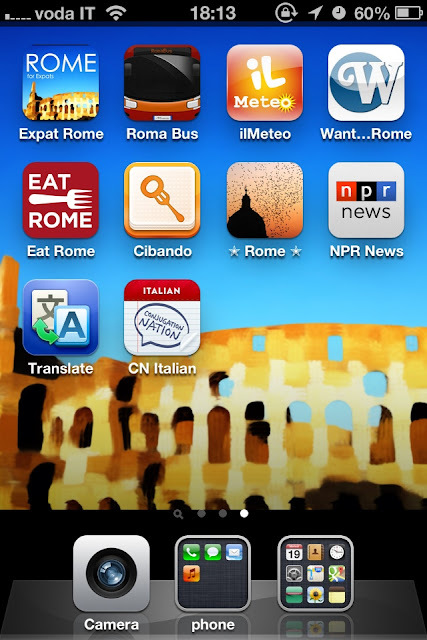 There are a bunch of apps out there that can make your life in Rome a little easier. Roma Bus - This app tracks (most) of Rome's public buses so you know if it is faster to walk or wait. You can also geo-locate yourself and it will tell you what bus stops are close. Il Meteo - As they say in Italian, Marzo è pazzo, March is crazy. The weather has been a little chaotic these days. Il Meteo will help you know if it's time to put the winter boots and scarves away yet. Wanted in Rome is a useful, information packed website. Have news, events and classified at your fingertips with this app. Eat Italy - my pal Elizabeth's App. I use this all the time. Cibando - What is so cool about this app is tat you draw on your screen map the area you are looking for and voila, the team at Cibando does the rest. Rome Insiders Guide - Flaminia's app is not strictly a food app, but she has loads of great suggestions for places to eat and explore. NPR- I listen to NPR almost all day long. It is my background noise as I type. When I can't sleep, I use this app to stream All Things Considered or Fresh Air on Hawaii time. Google Translate - Want to make sure you understood that snappy tweet, or what you need to say at the hardware store, the google translate app even has audio. Conjugation Nation - I have a vast vocabulary in Italian. Of nouns. I feel like I know about 2 verbs and only in the present tense. This app makes practicing more like a game than work. Rome for Expats - This one is mine. All of my picks for where to find things and expat might be looking for, like cheddar cheese, an english speaking hairdresser and the best burgers in Rome. My app is now an ebook available on Amazon. I love your app and I used it all the time when I first moved to Rome. I use Roma Bus all the time, even if it's not 100% reliable. There's also a good train app called Locomotimes that is quite handy. Thank you Rick! I am so happy to hear my App helped you.